We are all aware of the benefits honey has for our skin but what does it do for the body? Well, honey has some pretty good benefits for our health as well. And yes it is really sweet, so you might be thinking it will cause weight gain however the opposite is true. I have listed two major benefits of taking honey below. When we sleep our brain uses energy, part of this energy comes from sugar stored up in the liver called glycogen. According to studies, raw honey produces more of this glycogen than cooked foods. Our bodies only store about 75 grams of glycogen at a time and uses up 10 grams every hour. So imagine how short you are of this vital element around 10pm or 11pm when you go to bed if you had dinner around 6pm. Very little! And so when we consume honey at night it aids in getting that beauty sleep since our brain is getting sufficient energy. When your liver does not have sufficient glycogen, it causes stress on your brain resulting in you not sleeping well. And since the body is in stress mode, it will store up more fat. A normal functioning body should burn fat whilst we sleep but if your body is under this stress, you miss out on the fat burning exercise daily so instead of your body burning fat it is storing it. So eat up that honey! So some nights, in fact most nights i cant bring myself to eating an entire tablespoon of raw honey, so i will mix 2 tablespoons with some warm water or tea and that makes for a more bearable taste. Give it a try for a week, let me know how it works out for you. Thanks Gingi :) Have a blessed week! Honey is the bomb. I use it on my face from time to time. Its a jam! 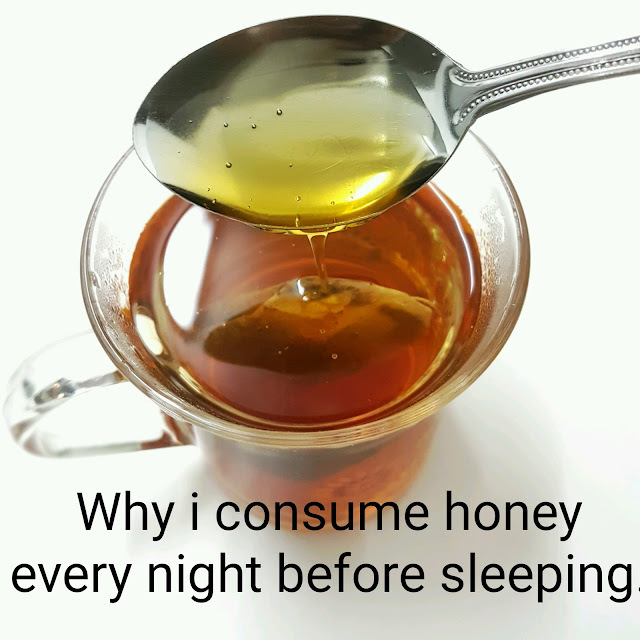 I didn't know honey was good for sleeping, I should give it a try! Thanks for the tips! I am totally gonna try this! Thanks for sharing! You're welcome Kathrine. I hope it works for u! Great tips. I personally really like honey. You're welcome Susanne :) I'm glad you found it beneficial! I love honey and I even use it on my face as a mask, or I combine honey with sugar for a face scrub. And let me tell you, the results on my skin are amazing, best scrub I have ever used! This is a great post Nyansha. On ritual I do in the night is drinking loads of water before going to bed. This is a great addition to explore. Wow I didn't know there were so many benefits to honey! I might have to try some before bed. I try to have tea at night, so maybe I'll throw a splash in. Thanks for this! I am really loving your blog! Followed you on Bloglovin! I have never tried honey before bed but will give it a go tonight. I am a chronic insomniac and I'm willing to try anything to help my sleeping problems. I'm so happy you shared this information! So many benefits, I will definitely be trying this! Yea Jenn, it tastes weird at first but then you will get familiar with the taste. Have a great weekend !! This is such a great, informative post, beauty! I'll definitely be adding honey into my nighttime routine! Thanks so much for sharing and I hope you're having a great week so far! Thanks Jalisa :) Have a great weekend! I've never tried this before sleep! Sounds like it has some great benefits. Thanks for sharing! I had no idea honey was so helpful for sleeping!! Thanks for sharing!! Great tips. I know honey so many great benefits but I don't really like its taste. Then we have something in common Sandra :) Have a great weekend! I have some trouble sleeping sometimes and didn't know honey could help, will give this a try!! Very nice tips, usually I only eat honey when I'm sick but I need to start doing it more often. Yes dear, try and make it a habbit. You won't regret. I love the taste of honey and use it to sweeten food, but I had no idea it was good for sleeping! I am definitely going to try some before bed! I know that Honey has many wonderful benefits and our house is never without it but I didn't know it was good for sleeping too. Thanks for these great tips! wow good to know that! Thanks for sharing this tip, i'll try it. You're welcome Cvetina. Thank you for reading!! wow didnt know about the weight loss. Thanks for sharing. I didn't know about the benefits includes improving one's sleep , so glad i stopped by and thanks for sharing these awesome tips. Im glad you stopped by too. Thanks Uzo ! Honey also works amazing for my body! When I feel I´m about to get a sore throat I do a mix of honey+lemon+hot water! loved your post! I had no idea that honey positively affected sleep! i'll go drink a honey mixed drink now before bed! I tried the honey and cinnamon weight loss diet every night before bed. It really did work. I like honey when I have a sore throat, it works perfectly. Didn't know you could use it to improve sleep or for wight loss. I would definitely try this.